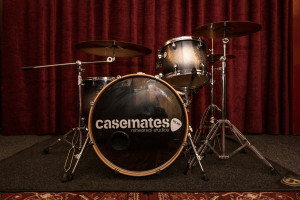 Casemates has been an established music rehearsal studio since 1994. It has recently been taken over by new management and redesigned to accommodate bands at any stage of their development. Casemates features three upgraded rehearsal studios that can accommodate up to a six piece band. Each room features top of the range Mackie active speaker systems and includes the use of microphones, stands and cables. Alongside the three standard studios, we also have our Showcase Studio. This large space allows for bands not only to rehearse, but is the perfect environment to record your own demos, or even music videos. This room can accommodate larger bands of up to 10 musicians and also has a chill out area to relax and enjoy your rehearsal time. At Casemates we aim to offer affordable rehearsal solutions in a relaxed and professional environment.